My level of obsession with this ship is probably way too high to be healthy. But, being completely honest, I'm totally okay with that. To put it in perspective: I'm a very frugal person and don't spend money on fandom merchandise- ever. 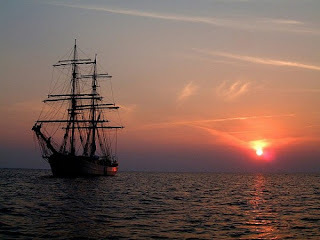 For this ship, I bought a navy sweatshirt that says "Team Rhysand" on it and I wear it proudly in public. There's just something about the equality between them and the respect that they have for each other that really just makes them work so well together. They don't always get along either, which may seem like it would work against them, but really creates a more believable relationship where they can resolve their conflicts and disagreements in a realistic and healthy way. Contrary to most readers of this series, I started to ship them in book 1. Yes, even with all the creepy touching and inappropriate comments and everything else that was working against Rhys at that time. I would like to point out though that in my mind, I saw his reasoning for doing those things. Maybe not all of them- the little details that he reveals later- but for the most part I got the vibe that he was doing the least that he could do to maximize Feyre's safety and health while she was in that hellhole Under the Mountain. I also did not like Tamlin because he was just pretty and sitting there, and I know he had his own circumstances of being bound by Amarantha. 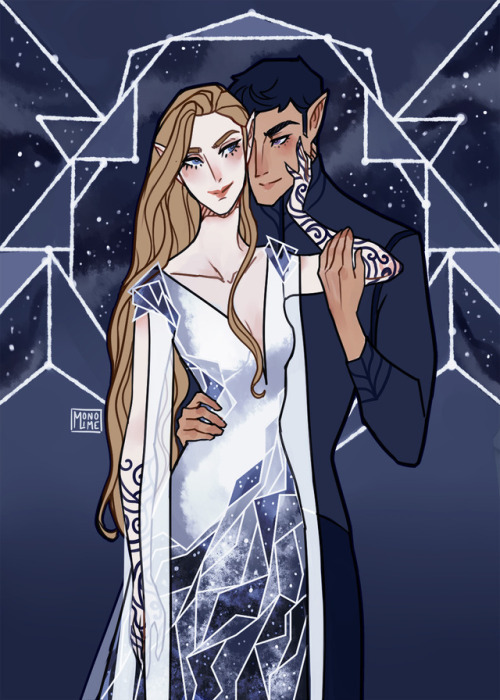 However, when he did break away from her, he tries to hook up with Feyre. Um....what? But yeah, I started shipping Feysand book 1. I didn't ship them as much as I do now, but I was definitely hoping she would end up with Rhys and not Tamlin. Yeah me! These two have a lot of really great scenes. In general, I love when they play "thought for a thought." Even the concept of this game is built on a foundation of trust. Trust that the other is being honest and trust that they won't judge you or tell another person what you said. It's completely beautiful. 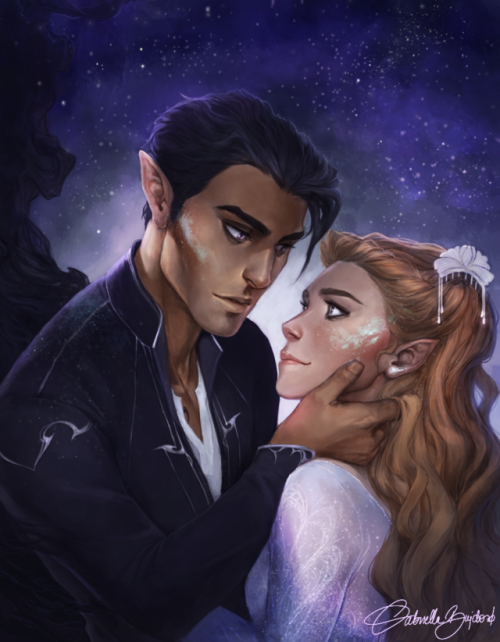 A specific scene though that I love (and I'll keep it PG-13 or younger) is when Feyre celebrates Starfall for the first time and she paints the star splatter on Rhys's hand. She laughs and Rhys stops still because he knows that's the first time she has done so since Under the Mountain. It kills me because Feyre is fully comfortable with Rhys and is starting to heal. And Rhys is starting to heal too and this scene shows that he really only wants Feyre to be happy and what is best for her. Understandably, it takes Feyre a bit to be open to this relationship. 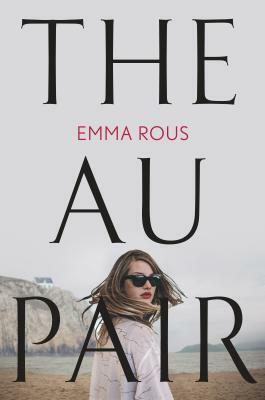 She has had a hell of a time in the fey world, so it makes complete sense to me that it isn't until the end of the second book that she actually beings to accept Rhys as something other than a friend. What I really appreciate about Feyre is that she is more than just her role in the courts and with other characters. You can really see this in her passion to paint and I think it is really reflective of how her relationship with Tamlin worked versus her relationship with Rhysand works based on how she paints. After she was Under the Mountain, she couldn't paint at all. But being with Tamlin couldn't bring that back for her- she was stuck in this depressive state and Tamlin was doing nothing to help bring her out of it. Rhysand on the other hand is when she started to paint again and I think part of it is because of how Rhys helped pull her out of her depression. Feyre is able to be her whole self and feel secure enough in herself and the chance to mess up when she is with Rhys. What a gem. My favorite thing about Rhys is that he pays attention to Feyre and communicates with her. 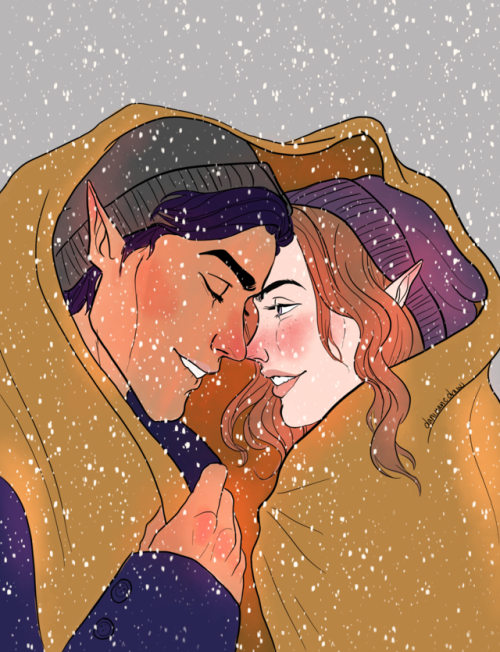 Since they were Under the Mountain all the way through the war and into A Court of Frost and Starlight, Rhys has paid attention to Feyre to make sure she is not just okay, but the happiest that she can be and that he sets aside his own desires. The fact that he knew they were mates and was going to let her get married won him some major points in my book. It broke my heart, but it made him all the more endearing to me that he would do something like that for her. As a character alone, I also really appreciate the sass and the clever comments that come from him. The way he holds himself and acts around his family even though he has so much authority and power shows just how good of a guy that he is. There are a lot of reasons why I think they work really well together. One of my reasons why they're a favorite of mine- definitely one of my OTPs- is because they are so realistic as well. They argue and disagree with each other and there are still moments when they aren't on the same page, like with their views on Nesta. I don't agree with Rhys's perspective on this, but it drives home the point that these two still function even though they are different people. They respect each other's opinions and differences and will talk through things together that they need to have a mutual agreement for.